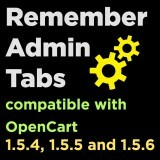 "Remember Admin Tabs" will keep track of your most recently selected tabs in all areas of the OpenCart admin panel. When you go back to edit a product, category, or any other screen with tabs it will remember the last clicked tab and return you to there. Since product option tabs can vary these are remembered per product. When used in conjunction with one of the many available extensions which add the "Save & Continue" button to various pages, this will greatly enhance your catalog management experience by allowing you to save your work, see the updated page in your store and resume edits without ever leaving the page and tab you are working in. This extension allows you to create and save a custom HTML Mega Menu for each category. 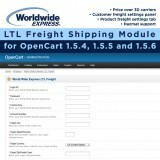 Worldwide Express LTL Freight Shipping module adds the ability to integrate your World Wide Express account and get freight shipping quotes directly from their SpeedShip service. 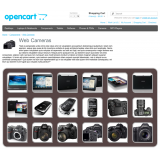 This extension will greatly enhance the functionality of your Banners and the Slideshow Module (Nivo Slider) which comes standard in the default OpenCart installation. Easily adjust any and all settings for Nivo Slider as explained HERE, such as Animation Speed, Pause Time, Caption Opacity, Effects, etc. 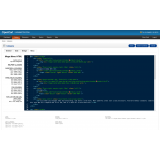 Add Custom CSS for each slideshow from within the admin panel, giving you ability to control the appearance and position of text & images, or define custom classes for use in caption text. "Save & Continue" button for Both Slideshow module and Banner editing. This is a vQmod which allows you to use product options to modify it's dimensions, just as you would with price, points or weight. You can modify the dimensions based on addition (+), subtraction (-), multiplication (*), or equal to (=). 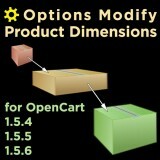 Just drop the file "options-modify-dimensions.xml" in your vQmod xml directory and you're ready to go! After it's installed, the first time you edit a product 4 additional fields will be added to the "product_option_value" table. No Core files will be changed. To use, open a product for editing in the admin panel and click the options tab. Here you can enter numeric values for altering product dimensions length, width & height in the cart using +, -, * or = modifiers. As a safety precaution, always backup your database & installation directory before installing new software. To uninstall simply trash the xml file. If you wish you can remove extra fields which were added to your database table product_option_value: dimension_prefix, length, width & height.